As Muslins across the world today celebrate Eid-l-Kabir occasion to commemorate the Sallah festival, world leaders have called on them to use the celebration to thank God for another opportunity for life as they continuously pray for peace and co-existence amongst our fellow religious brothers and sisters. Though, the Nigerian Government has declared today Friday and Monday public holiday to mark this holy celebration for all the muslin faithful. 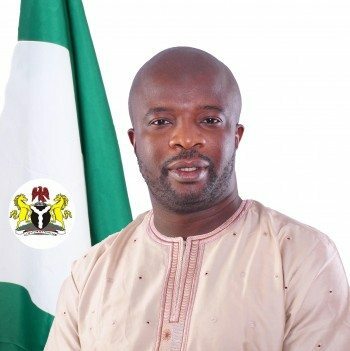 The chief sponsor of the popular \'not too young to run bill'‎ and Deputy Chairman ho‎use committee on Capital Markets And Institution Hon. 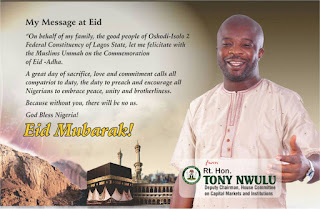 Tony Nwulu has Joined top voices to felicitate with Muslins as the observe today\'s Eid-l-Kabir Sallah Festivity. On behalf of my family, the good people of Oshodi - Isolo 2 Federal Constituency of Lagos State, let me felicitate with the Muslims Ummah on the commemoration of Eid-Adha. A great day of sacrifice, love and commitment calls all compatriot to duty, the duty to preach and encourage all Nigrians to embrace peace, unity an brotherliness. Because without you, there will be no us.